At Cabinet Magic Inc. we believe in QUALITY workmanship, which we consistently deliver through our EXPERIENCE and our INTEGRITY. Our pride and personal involvement in the work we perform result in superior quality and service. This attitude is also directly reflected in our employees’ level of responsibility, professionalism and competency. Our continued business success and longevity relies on referrals from satisfied clients as we remodel lifestyles through quality home improvements at fair and reasonable prices. Cabinet Magic is a full service kitchen and bath remodeling contractor specializing in creating beautiful, functional custom cabinetry from scratch right here in La Habra CA. We give our clients MORE than they expect in quality, service, and an amazing end result in their home. 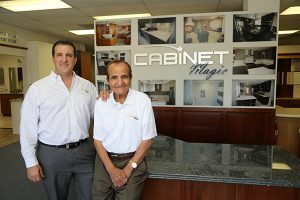 Cabinet Magic was founded in 1989, when current owner Mark Nubani’s father moved the family from Chicago to the West Coast in pursuit of his dream of owning his own company. Today, our company maintains Midwest integrity and values, placing a strong emphasis on providing personal attention to every homeowner and making sure our customers are satisfied on every level. In high school, Mark Nubani dreamed of becoming an architect. During college, his focus changed to business and marketing. While earning his Business Degree, Mark worked alongside his father and this staff learning how to install kitchens, bathrooms, and related projects. He saw what attention to detail was required to do the job right and how the small details and communication made a difference. He watched and supervised countless projects from demo through completion resulting in amazing transformations of beauty and functionality. This allowed him to earn his contractors license and add to his list of credentials and expertise. With a background in both business and building, Mark is now able to offer services and management backed with organization, communication, quality products and an understanding of the importance of customer service. Does the fact that Mark is a magician member at the Magic Castle in Hollywood also contribute to his ability to work real magic in transforming his clients’ homes? Call Cabinet Magic for your free in home estimate today and find out for yourself.